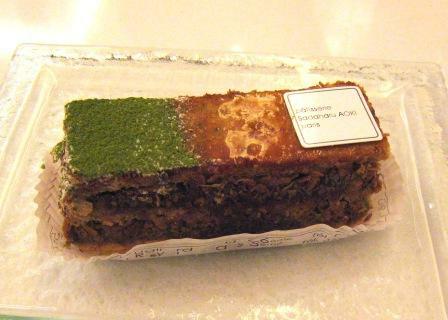 We were in Paris for the weekend and went to Sadaharu Aoki's pastry shop. As you might have guessed from the name, the chef is Japanese but trained in both Japan and France. The tiny shop is all white and staffed with oriental women. There are two tiny white tables that can seat two people each. We sat at one while a Parisien in fur sat at the other. The stark white color plays beautifully against the browns, greens, and other colors on display in the pastry counter. I tried the wonderful Mille-feuille with Green Tea. It was outstanding. The layers were crunchy and crumbly. The filling tasted balanced and rich--like soft butter infused with tea. The powder on top did not distract. Oriental is an adjective to describe objects, not people.